Boasting restaurants in several parts of the world and a whole line of Thai food products for export, Blue Elephant sets a high bar for royal Thai cuisine. 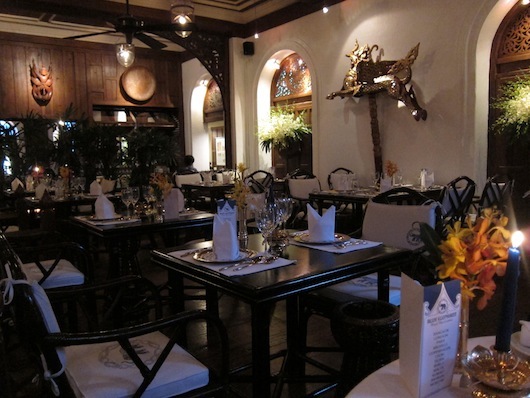 Set in a gorgeous Colonial-era house, the Sathorn Road location is a fine choice for a refined dinner splurge. Appetisers at Blue Elephant start at 200 baht with mains running up to 1,000 and bottles of wine from 1,350 to… 23,900 baht. Even a small Chang beer goes for more than 200 baht. In general, prices here resemble those of fine dining establishments in Europe, Australia and the US; but it’s worth it, perhaps as a way to savour that last night of your holiday. The three-storey historic building is most welcome among the gleam of Sathorn's high rises. The restaurant occupies a century-old building on Sathorn Road that housed the Thai Chamber of Commerce for some 70 years. During World War II, the occupying Japanese chose this building for their central command centre. 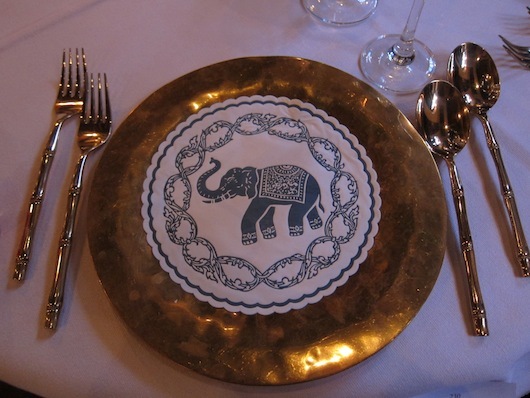 After first opening restaurants in Brussels and London, Blue Elephant moved here in 2002 after a full restoration. Surrounded by a skytrain station and several tall, modern buildings, the cream-yellow mansion with blue and white trim is a historical landmark. One really does feel like royalty while dining here. Inside, the restaurant is sectioned into several separate rooms decorated with crystal chandeliers, Thai art and handicrafts, teak floors and louvered wood shutters. Dim lighting is enhanced by single candles on each table, all of which are also adorned with fresh orchids, white table cloths, polished bronze cutlery (true to the Thai way it’s spoon and fork only), and bronze dishes with signature Blue Elephant place mats. Before each dish is presented, servers donning traditional Thai attire place ceramic plates on the bronze platters, encouraging diners to keep with Thai custom by sharing. In a word, the place is elegant. 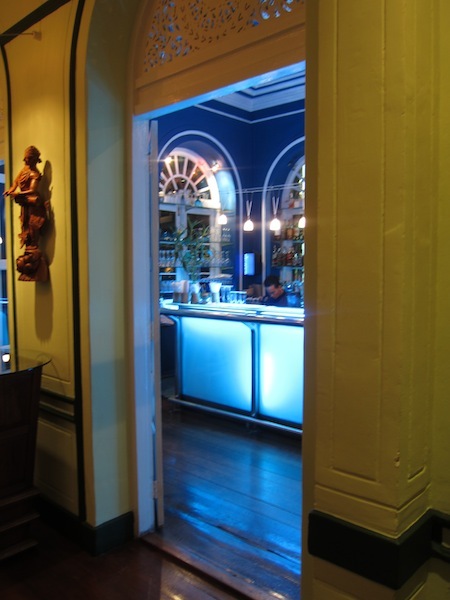 If looking for a more casual but still sophisticated setting, head upstairs to the Blue Bar, where inspired cocktails using Thai ingredients like lemongrass and kaffir lime are served in a spacious lounge. 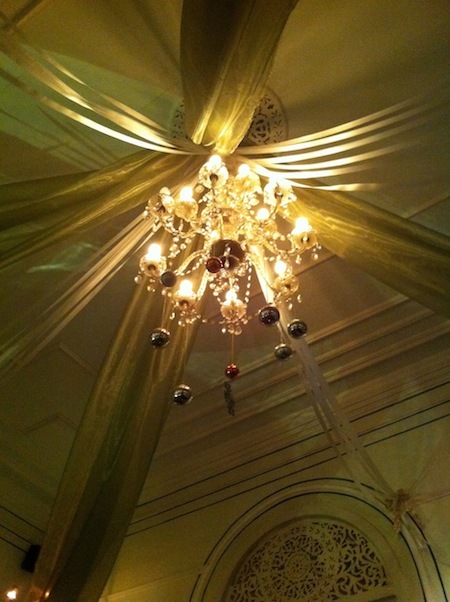 Full dinner may also be enjoyed upstairs, and throughout the restaurant we found the service impeccable. ... with a hint of chic. Blue Elephant’s menu is broken into three categories, each including starters, soups, and mains made in the tradition of “royal Thai cuisine“. In other words, each dish is prepared as though it were for the King and Queen’s dinner table with excellent ingredients (mainly from within Thailand) and perfectionist methodology. The “royal” difference lies in how the dishes are prepared. Seafood and meat are served entirely without bones or shells, fruits and vegetables without stems or pits, and careful attention is paid to balancing the spicy, salty, sweet and sour flavours. This is a menu that has obviously been worked and re-worked with care. The menu’s first section, “Thai cooking of yesterday”, aims to present old-school Thai dishes like ka-pi khua (a particular shrimp paste with steamed Thai vegetables) and gaeng massaman with lamb. The second section, “Thai cuisine of today”, boasts some of Thailand’s modern standards like som tam, laap duck salad, gaeng panang with beef, and tom yum soup with shrimp. The final section, “Thai kitchen of tomorrow”, is where the chefs show off their culinary fusion offerings like lamb chops with Thai wild basil and a Thai-Belgian shrimp croquette enhanced by a mix of Belgian cheese and Thai green curry. Though everything we’ve tried from each menu has been very good, the “kitchen of tomorrow” menu is the most interesting, with other standouts including a laap-style salad made with raw salmon, and a fois gras with tamarind sauce. On our most recent visit, we were offered a complimentary taste of tom sab soup with salmon alongside a spoonful of fresh and slightly spicy cold string bean salad. So tasty was the soup that we ordered a small pot to share along with the “pearls of Blue Elephant” appetiser sampler from the “today” menu. Although the sampler was smaller than expected for 550 baht, it did provide a taste of Thai snacks like buffalo satay, flying pomelo salad, and “golden bag” fried crab wontons. 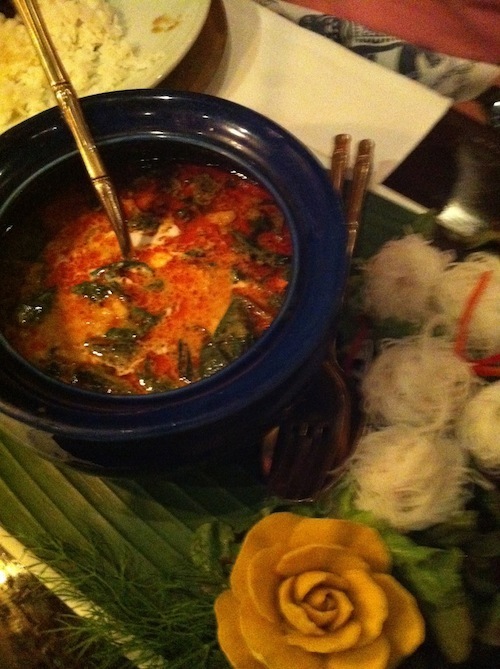 For our main course, we indulged in massaman with lamb curry served in a ceramic hot pot with built in flame to keep it warm, and a red curry with crab meat and betel leaves along with an accompaniment of pad Thai with jumbo prawns. Reminiscent of a hearty stew, the massaman featured slow-roasted, tender slices of lamb along with chunks of potato and cashews in a rich and bold curry that added a tinge of spice and sweetness. 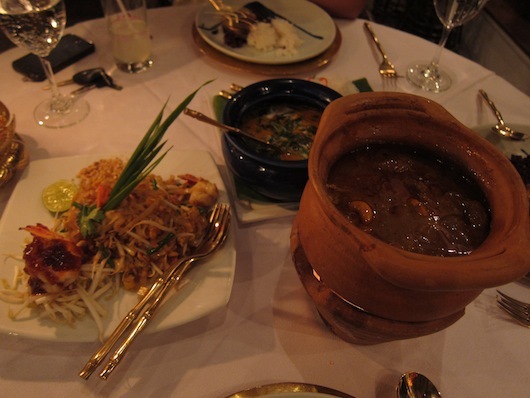 Pad Thai, massaman, crab curry -- royal style. The crab curry was far lighter and spicier, and the light red coconut curry sauce didn’t overpower the sweet and savoury crab meat, which was the highlight of the meal. The pad Thai was still pad Thai, but it was well-balanced in flavour and the addition of jumbo prawns made it a worthy add-on at a price that ensured we would be full without sending our bill too far through the roof. On a previous visit we tried laap salmon, nam tok tuna, sea bass hor mok, and pork curry with chamuang leaves, and we’ve yet to sample anything that wasn’t very tasty. Crab curry with betel leaves -- yes please. 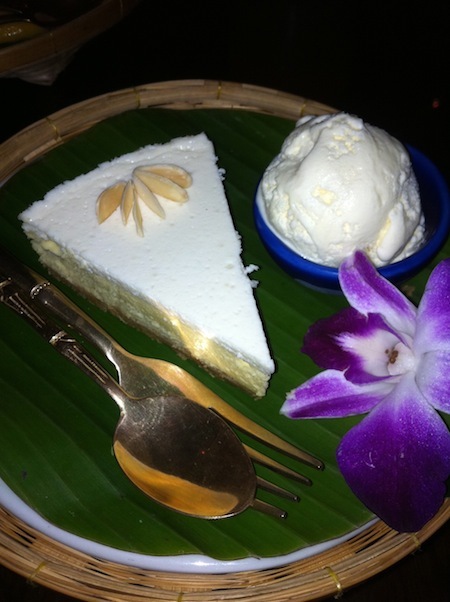 For the adventurous, durian cheesecake is a must-try dessert; the pungent flavour (and smell) of the king of Thai fruits comes through loud and clear but the richness and creaminess of it leaves no doubt that you are indeed eating a cheesecake, and a side of coconut ice cream balances the intense durian flavour. If durian is a bit much for you, the mango cheesecake, ginger creme brulee, and black sticky rice pudding all look good. Durian cheesecake -- fit for royalty. 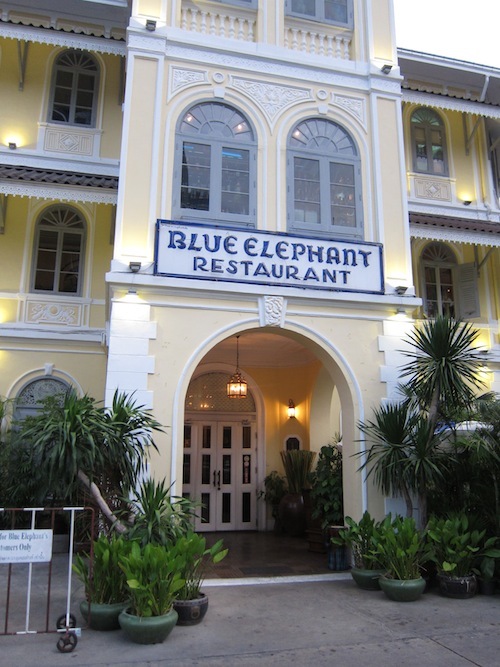 Blue Elephant also operates one of Bangkok’s more prestigious cooking schools, and they run a dozen total restaurants mostly in Europe and the Middle East, with another Thailand branch on Phuket. Dress is “smart casual” (long pants are a requirement but T-shirts are fine).